With the recent outbreak of Swine Flu affecting Mexico and other countries around the world, it has now worked its way into the gaming world. More specifically with Capcom's scheduled showcasing of Dead Rising 2 at this year's E3. Capcom was to demo an early development version of the game but due to the Japanese government's travel restriction advisory have cancelled such plans. Japanese citizens are being asked to avoid international travel due to the large number of reported cases of Swine Flu in Japan. In fact, the first case of Swine Flu was reported in Osaka where Capcom's head office is located. This news might seem a bit odd considering that Blue Castle, who is developing the game is located in Vancouver, Canada and obviously far from Japan. That said, Kenji Inafune the executive producer on the game, is based in Japan and will not be making the trip to E3. Mr.Inafune was to personally demo the game. 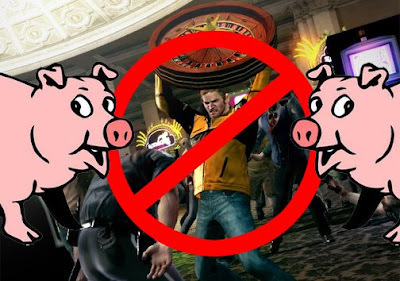 As reported by Kotaku, Chris Kramer - Capcom's Senior Director, Communications and Community - made the following statement, "Dead Rising 2 is the only game we won't be able to showcase at E3, because it's at an early stage of development and the team is not comfortable having anyone else demo the code." So...here's a question, no chance the demo could be done remotely? Damn you Swine Flu. I love the pigs man, nice touch. This made my day.